On October 18, 2007 the grower prepared seven unique mixtures of flowering plants to be grown from cuttings in 6½ inch pots. Mean Shoot and Root Dry Weights. 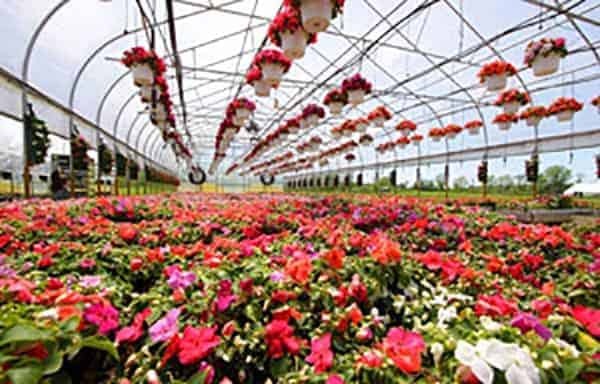 Plant mixtures selected by Faribault Growers for sale with as hanging baskets. At 8-9 weeks plants would typically be transferred into12 inch pots, grown for another 4 weeks, and sold to retailers as hanging baskets. Sixteen pots of each mixture were arranged on the greenhouse bench in two blocks. Each block consisted of 4 pots irrigated with normal well water and 4 pots of each block were irrigated with well-water super-oxygenated with a custom built flow-through oxygenation system. Irrigation water was supplied at 0.5 gallons per minute. The oxygen concentration of the well-water was 2.42 mg/L and the oxygen concentration of the super-oxygenated water was 11.44 mg/L. Irrigation was scheduled as determined by the grower. Fertility was supplied by a liquid feed grower supplied injector down stream from the oxygenator. Plants were grown from cuttings for 2 months. Three mixtures were harvested December 6th, two harvested December 13th, and two mixtures (#3 and #4) were not harvested at the grower’s request. Several replicates from each mixture were left at the growers request for later use. 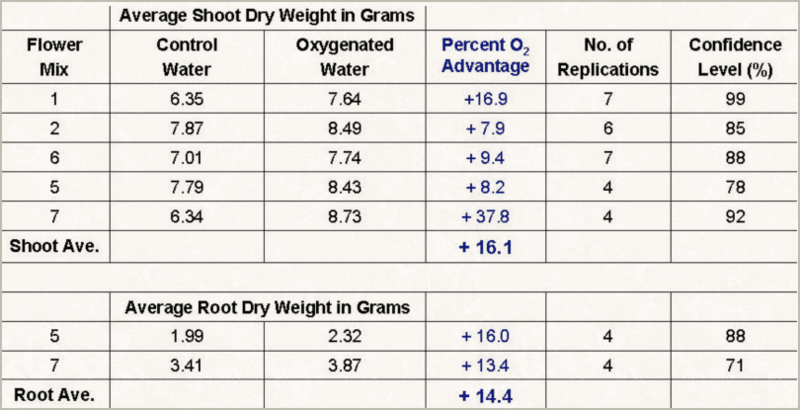 Total shoot dry weights were determined for all harvested mixtures. Root dry weights were determined for the two.